Valmont Newmark offers customers superior alternatives to wood distribution poles. 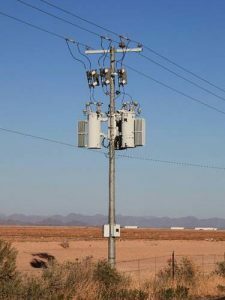 Our poles are designed to meet the same ANSI 05.1 height and class requirements as wood poles when the load factor is in accordance with NESC. Easy-to-Use: Pre-drilled to accommodate special framing requirements. Deflection: Designed to have similar defection characteristics to wood poles. Flexibility: As a standard, steel poles are direct embedded. Reliability: Designed to meet minimum yield strength, not mean rupture strength. Steel poles will withstand loads now and in the future and will not deteriorate. Environmental: They are an answer to EPA regulations and deforestation issues. The poles are non-toxic, reduce disposal problems and costs, and they can be reused or recycled.